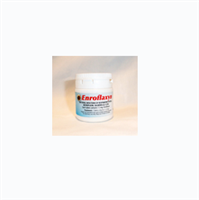 Very effective against paratyphoid, e-coli and serves as a general antibiotic against a broad range of bacteria. Dosage: 1 teaspoon per gallon of water for 5 - 7 days. Very effective treatment for coccidiosis, e-coli, salmonella. Dosage: 1 teaspoon per gallon of water for 5 days, then 2 days of probiotic, then 5 days of treatment again, followed by 2 days of probiotic again. Individual treatment for paratyphoid, e-coli and coccidiosis. Also used for one eyed colds. Dosage for smaller birds: 1/4 to 1/2 tablet per bird for 5 - 7 days. Sulfa based product for the treatment of e-coli, paratyphoid and coccidiosis. Contains 20 mg trimethoprim, 100 mg sulfamerazine. Treatment for paratyphoid, e-coli and coccidiosis. Also used for one eyed colds. Dosage: 1cc per quart of water or 4cc per gallon of water for 5 - 7 days. Water soluble treatment for bacterial infections - respiratory, salmonella (paratyphoid), e-coli. Dosage: 1 teaspoon per gallon of water for 7 -10 days. Same treatment as the enrofloxan liquid but in tablet form for individual treatment. Treats respiratory, paratyphoid, e-coli. Dosage: 1 tablet per bird for 7 - 10 days. Individual treatment for coccidiosis, e-coli and salmonella in pigeons. Dosage: 1 tablet per bird for 5 days, then 2 days or probiotic, then 5 days of 1 tablet per bird, then followed by 2 days of probiotic again. A natural remedy for the treatment of e-coli infections in pigeons. Very effective. Also used to treat diarrhea, bacterial infections, gastro-intestinal infections. Dosage: 4cc per gallon of water for 7 days. Dosage: for 4 days, 2cc per quart of water (8cc per gallon) followed by 3-6 days of 1cc per quart (4cc per gallon). A treatment to combat Young Bird Sickness, developed by a veterinarian in Belgium. 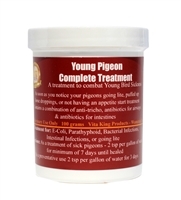 As soon as you notice your young pigeons going lite, puffed up, loose droppings, or not having an appetite start treatment. Also good for Young Pigeons before training starts. Contains a combination of anti-tricho cure, antibiotics for airways, & antibiotics for intestines.